Dubai and Abu Dhabi: A five day visit: Part III. After two days exploring the city of Dubai with its towering skyscrapers and golden sand beaches, I checked out of the Grand Hyatt Hotel and my friend Laila came to fetch me for the drive to Abu Dhabi. Depending on where you are going the distance is about 120 km and the road is straight and in excellent condition so the driving time at a reasonable speed is about an hour and a half. For long stretches of road, all you see is sand and scrub, and it is incredible to think how these cities have risen out of the desert. 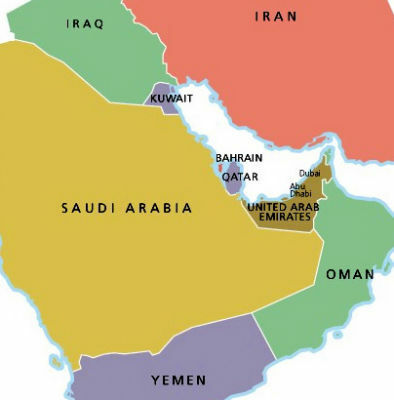 Several people have commented after reading my earlier posts, that they had only a vague concept of where Dubai and Abu Dhabi are so I thought I would post a couple of maps to set the stage. Here are the outlines of the cities of Dubai and Abu Dhabi. The first is a map showing some of the many hotels based on a Google map and also shows the man-made islands. The second shows Dubai city from a different alignment but you can see how The Creek splits the city in half. The last map is an outline map of Abu Dhabi. On our way to Abu Dhabi, we talked about plans for sight seeing. Basically I had one and a half days to spend with Laila as my flight would leave from Dubai airport around one am, two days later. There was so much to see of the usual touristic nature, but I had another special interest. I really wanted to see the hospital where Laila works, and in particular, the Department of Pathology & Laboratory Medicine, of which she is the Director. 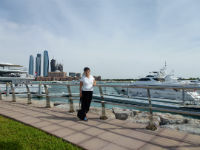 It was over a decade ago that she was an outstanding medical resident training in our post-graduate program at the University of British Columbia, and I was eager to see first- hand what she has achieved in her career since returning to Abu Dhabi. On arrival in Abu Dhabi we went first to Laila's house where I met three of her children. The eldest, whom I had last seen as a baby, was away at college. After I settled in to her charming guest room, we headed out to lunch and to meet her husband, whom I had last seen when he was also completing post-graduate training in Vancouver. That evening my hosts had been invited to an engagement party at the Shangri-La Hotel and their friends had graciously extended an invitation to me to accompany them. It was a warm clear evening and the party was held on a grassy terrace with a panoramic view over water. They served a marvelous buffet banquet. The next morning I woke at my usual early hour and enjoyed an early coffee. After breakfast, we set off to see some high-lights of the city. The federation of the 7 emirates that make up the UAE, was established on December 2nd, 1971. 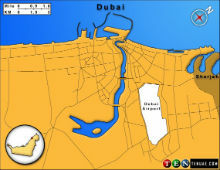 The city of Abu Dhabi which as you can see from the map above, sits on an island in the Gulf, is the capital of both the emirate and of the UAE. The emirate of Abu Dhabi is the largest; 87% of the total land area of the UAE. Quoting from a placard in the museum we visited, " Sabkha (salt flats) line much of Abu Dhabi's coastline. Inland the emirate is composed of sand and gravel desert. To the south the dunes of the Rub al-Khali (the Empty Quarter) ...stretch for hundreds of kilometers. Jebel Hafeet in the east, rises 1180 metres above sea level. 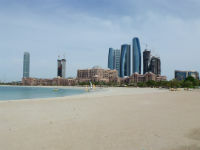 Abu Dhabi's coastline is dotted with more than 200 islands." The Emirates Palace is a luxury hotel located next to more than a kilometre of pristine white beach and also has two huge pool areas. The interior is a marble and gold extravaganza. 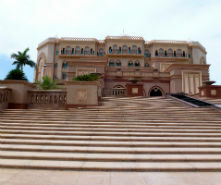 This is the view from the steps leading up to the entrance of the Emirates Palace Hotel. This complex of towering buildings is the closest I saw to what you see everywhere in Dubai. The architecture is amazing - I wish I knew more about design. It is interesting to me that in these desert environments, there are fountains everywhere. Sea water desalination is supposed to be big here. It makes sense, I guess. As you look up the steps towards the hotel, you see yet more water running down each side of the steps. We spent quite a long time enjoying the luxurious interior and then walking around the grounds of the hotel. 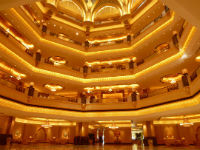 These pictures can give a perspective of the interior luxury of the hotel, the long white beaches and sparkling water. 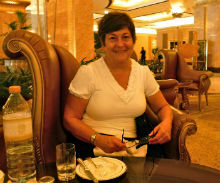 We enjoyed an early light lunch at the lobby coffee shop, Le Cafe at the Emirates Palace Hotel. Later that evening we met some of Laila's colleagues for dinner at Agadir, a Moroccan style restaurant at the Westin Hotel. The other wonderful opportunity I had was to visit the Department of Pathology & Laboratory Medicine at the Sheikh Khalifa Medical ity, where Laila s the Department Head. But that story is still to come. In case you missed my earlier posts and pictures from my short visit to Dubai and Abu Dhabi, check out these links. Dubai and Abu Dhabi: A five day visit: Part II. Dubai and Abu Dhabi: A Culinary Exploration Part I.
Hong Kong to Dubai. Exercising my spontaneity gene! Dubai and Abu Dhabi: A five day visit: Part 1. 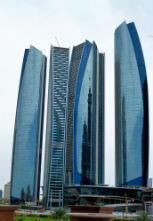 Dubai and Abu Dhabi: A five day visit: Part 11. 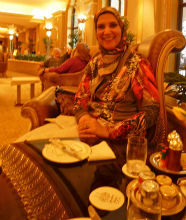 Dubai and Abu Dhabi: A Culinary Exploration: Part I.
Dubai and Abu Dhabi: A Culinary Exploration. Part II. Formal Night - and Captain's Table. More dancing in the Queen's Room on the Baltic Cruise.